Bathroom mirrors play such an important role in any bathroom. Mirrors help reflect natural light into the bathroom space and as you probably know by now, a lighter and brighter bathroom automatically feels spacious. Mirrors can also be used to highlight a feature in the bathroom, maybe that feature wall you’ve worked on or a stunning roll top bath. There are things you need from your mirror though. They should not only be there to reflect light and highlight features, they should also offer convenience, practicality and they should be a functional item. The bathroom mirrors with shelves are a top choice when trying to find the most functional and convenient mirror for your bathroom space. These mirrors come in a choice of shapes and sizes which can brighten up any bathroom wall. They offer a clear reflection essential for getting ready for work or that night on the town and they have shelves which can house all your make up, shaving items and hair care products. The advantage of having the shelves on the mirror offers you that additional storage space that you need for your smaller bathroom items. Some of the stunning bathroom mirrors with shelves designs include oval, square and cone shaped. They are all completely unique in their design with ample shelving to store your items. One of my firm favourites is the Zola mirror with shelves, these bathroom mirrors with shelves have a wooden frame with a shelf on either side, the mirror is rectangular in shape to blend in with any bathroom design. What I really love about this specific design is you can mount it horizontally or vertically depending on your preference. Of course there aren’t only the bathroom mirrors with shelves available, there are LED mirrors, infinity mirrors and even mirror cabinets to choose from. What I do is work out the space I have available, you want the mirror placed on a wall which offers convenience, many of us prefer the mirror to be located close to the basin. Whether you have chosen the bathroom mirrors with shelves or an infinity mirror, you need to ensure the mirror isn’t too big for the space you have available. Whether it’s an LED mirror or a back lit bathroom mirror you have chosen, it should become an art piece on your bathroom wall. Mirrors play such an important role in any bathroom design. You’re probably thinking this statement is obvious, you need a mirror when getting ready in the mornings and having one in the bathroom saves you from running from the bathroom to a mirror in another part of your home. While this is the obvious reason for having a mirror in the bathroom, they also reflect light entering the bathroom offering a lighter and brighter space and best of all, they can be used to highlight a feature in the bathroom. There are so many great bathroom mirrors available, but my favourites are the LED bathroom mirrors. These mirrors not only offer you a clear reflection, but they have elegant LED lights around the mirror which add additional light to the bathroom space and ensure you enjoy a clear reflection throughout the day. Some of these mirrors come with digital clocks built into them, what a way to ensure you are never late for work again. 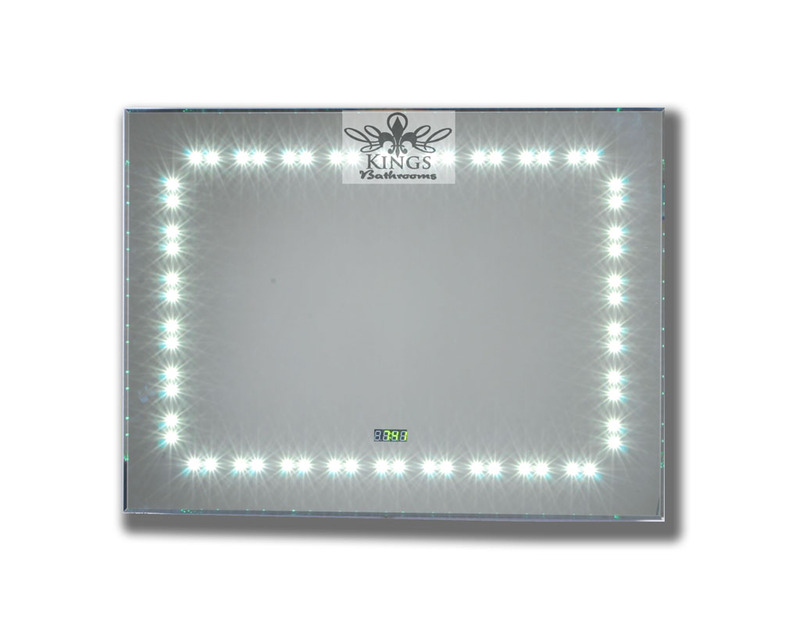 The LED bathroom mirrors can be used in any bathroom design due to the fact that they are available in a wide selection of shapes and sizes from those with lights all the way around the border of the mirror to those with lights at the top of the mirror and a digital clock at the bottom. The placement of LED bathroom mirrors is as important as the shape and style that you choose. Your mirror should be conveniently placed to ensure they are both practical and function in the space. At the same time they should be strategically placed to either reflect any natural light or to highlight a feature in the bathroom area. You will be amazed how placing LED bathroom mirrors on a wall which receives an abundance of natural light will immediately brighten your entire bathroom area. As you know by now a lighter and brighter bathroom will feel more spacious than it actually is. The last advantage to the LED bathroom mirrors is that you can use them at night for additional light rather than putting on the main light. This will give a welcome glow to the bathroom and best of all, it will not disturb the family every time someone gets up during the night. In a year where bathrooms are spa-inspired and oozing luxury, it’s no surprise that everyone is looking for great ways to add that glamour and sophistication to their bathroom space. Up until a few years ago the bathroom wasn’t considered important during the design process, people spent their money on their kitchens, living rooms and outdoor spaces. These days the bathroom plays a very important role in the home, its design can add value to the property when it comes time to sell. You don’t want to spend an arm and a leg when you want to add some sophistication to your bathroom space. Maybe you’re looking for affordable ways to give your bathroom that glamorous finish. If you want to avoid replacing all your larger bathroom items and completely remodelling your bathroom, but you still want to achieve a sophisticated finish, then you may want to continue reading. I love spending time paging through bathroom magazines, sneaking a peak at my friend’s bathrooms when I stop by for a visit and designing bathrooms that give the home a comfortable, relaxed and yet sophisticated bathroom space. One of the many options you have to add that little bit of something to the space is by adding LED bathroom mirrors. A bland wall in the bathroom doesn’t cause much of a stir, but putting LED bathroom mirrors on the wall not only look fantastic and give you that “wow” factor, but they are also practical and functional items to have. Every bathroom needs a mirror, you cannot dispute that. You use the mirror when applying your make up or shaving in the mornings and you can’t really manage without one, believe me years ago I live in an apartment where I didn’t have a bathroom mirror for the first few weeks and I wasted so much time running between the bathroom and bedroom to use the bedroom mirror in the mornings. The LED bathroom mirrors are available in stylish designs that will compliment any bathroom space, whether modern or traditional. They also offer the benefit of additional lighting, which if you have read my blogs, you know this is essential in making the bathroom feel lighter and bigger. Best of all if you place your LED bathroom mirrors carefully to reflect the natural light that comes into the bathroom, your bathroom space will not only benefit from a sophisticated and glamorous mirror that will turn heads, but it will assist you in achieving an abundance of natural light in the space. When you are looking for a mirror for your new bathroom design, you want a mirror that offers practicality and still makes a statement, maybe even being the focal point in your bathroom design. 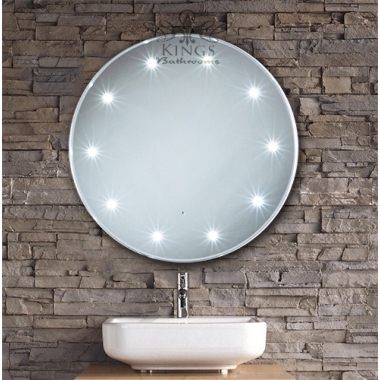 LED bathroom mirrors are the most suitable of all bathroom mirrors to do this, they come with superior lighting to help you get ready in the mornings, some of them even offer a digital clock to enable you to be on time and they come in a range of designs that are guaranteed to complement any bathroom. Have you ever had a hot bath or shower and then spend five minutes wiping the steam off the mirror so you can continue getting ready? With these LED bathroom mirrors that problem is a distant memory. The mirrors are rectangular in design with an easy pull cord system to turn on and off your lighting. The de-mister pad ensures that you will always enjoy a clear reflection even if the entire bathroom is filled with steam. These LED bathroom mirrors are the ultimate choice for any bathroom. The rectangular design is ideally suited for any bathroom while the shaver socket is an added advantage. These mirrors have the de-mister pad to ensure your reflection is always clear even if you have just climbed out of a steaming hot bath, but it’s the convenience of the sensors that make this mirror such a breeze, just wave your hand near the mirror and the lights will come on, no cords, buttons or switches to worry about when you’re still soaking wet. The simplicity of the square design of these LED bathroom mirrors is what makes them stand out from the rest. They have LED lights all the way around the mirror offering you ample light and the sensors ensure you can turn the lights on or off without having to flip a switch or push a button. These rectangular LED bathroom mirrors are stylish in design. While they may be the traditional rectangular shape the LED lights are located at the top in a stunning pyramid design while the digital clock located at the bottom ensures you can keep an eye on the time while you get ready in the mornings. These LED bathroom mirrors also benefit from the sensor controls, wave in front of the mirror and watch as your mirror comes alive with lights. I remember years ago when the only mirror you had in your bathroom was the wall hung vanity unit with a mirror on the door. These days there are so many options available, but if you are looking to add some glitz and glamour to your bathroom, then the LED bathroom mirrors are an absolute must. When I design a bathroom there are a few things that I want. I want a centre piece, something that will give my bathroom a “wow” factor. I want my bathroom to be light and spacious and I always want one piece of glamour, something that stands out and makes a statement. The centre piece is easy and can be achieved with a vanity unit or stunning roll top bath, depending on the bathroom size. Light and spacious can also be achieved even in the smallest bathroom with light colours, glass and plenty of natural light. But it’s the glamour side that can often leave me wondering which way to turn. The LED bathroom mirrors are a practical, stylish and beautiful addition to any bathroom and always offer the glamorous look I was hoping to achieve. These mirrors are available in a selection of shapes and sizes to blend in with any bathroom design. What I always do as a rule of thumb is keep my mirror in line with the rest of my bathroom design. When designing an ultra-modern bathroom with square toilet, basin and shower, I ensure my LED bathroom mirrors are also square and the same when everything has rounded edges I follow this through with the mirror. It helps keep everything uniform and then the mirror doesn’t look out of sorts sitting on the wall. What’s best is that these LED bathroom mirrors offer additional light to the bathroom, essential for those that do not benefit from an abundance of natural light. Light is an essential step for any bathroom, it’s what helps make the smallest bathroom feel spacious. Extra light is always beneficial whether you are trying to add a dramatic effect or just getting ready for work in the morning. Next these LED bathroom mirrors act as a beautiful piece of art on your bathroom wall, not only do they reflect the light and make the bathroom feel bigger than it is, but the light they illuminate is warm and inviting, making them the best choice for any bathroom design. The Paralympics is nearly upon us literally it will be starting in a couple of hours and I am very excited. The Olympics was simply outstanding and the atmosphere was sublime and as an added bonus Great Britain did well in the medals tally as well. It was amazing to see top notch athletes in the peak of human fitness breaking world records but for me I think the Paralympics is going to be even better. I mean breaking world records is one thing breaking world records with say only having 1 leg or scoring 5 amazing goals in football but being blind is simply outstanding. So I thought to myself how to link the Paralympics to a bathroom. Then it hit me, I love gadgets and so I thought I will find a few gadgets/products suitable to grace any Paralympian’s bathroom. Here are just three great gadgets/products that I found which are affordable and could be used by a number of athletes with a range of disabilities. This is the cheapest of the three items that I have discovered and it is a very simple product but has quite a wide range of potential uses. 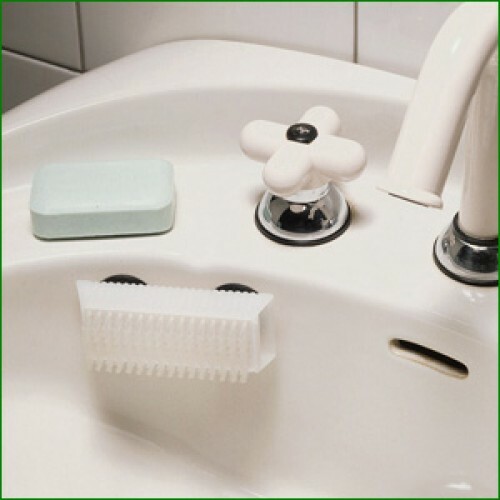 The product is a lightweight plastic brush that has the ability to be attached to most hard surfaces as it contains two suction cups on the back of the brush. 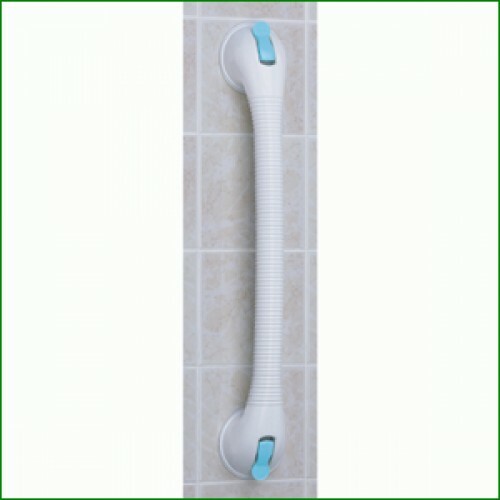 This gives the user the ability to scrub their hands, feet or sports boots with only one hand. The brush is easily portable and can be attached easily with only a small amount of pressure being applied to the brush. I think this is a great simple gadget that can be used in many different situations. The next gadget/product is similar in some respects to the brush yet completely different at the same time. The product is a grip that like the brush has suction cups on and can be positioned almost anywhere on a hard surface. The grip is a support unit that helps people with a disability grab hold of and help to either pull themselves up or lower themselves down. The added bonus for Paralympic athlete’s is that the grip could be used to do pull ups on or sits ups so the grip could be used as an exercise aid. The last but not least bathroom gadget/product for disabled people is a mirror that has LED lights that activate via a built in sensor. This is a brilliant mirror as you don’t need to touch, pull or move anything simply entering the bathroom is enough to activate the lights. This product becomes really useful if needing the loo in the middle of the night as there’s no need to be flailing about trying to find a light switch. A great product for disabled people as no extra effort is needed. So that wraps up my brief few bathroom gadgets/products for disabled people. I know there are hundreds more amazing products out there that can benefit disabled people greatly. As always please leave any comments as I love hearing from you all and I hope you all enjoy watching the Paralympics. Jumping straight in at the deep end with Why bother with bathroom mirrors? I mean does it matter whether you have an all singing and dancing mirror that light’s up via a sensor or is it all simply a gimmick into paying more for a simple necessity. The premise of having a bathroom mirror is one that I can pretty much say with almost complete certainty is that every bathroom in the UK has a mirror of some sorts. The fact that everyone needs a mirror for some daily health or beauty regime whether it’s applying make up or having a shave or even simply brushing your teeth, everyone has a mirror. So why blog about a mirror, well I’m simply asking the question why do we need hi-tech mirrors? The choice of mirrors out there is vast and multiplying on an almost daily basis each new hi-tech mirror with the latest must have gadget on such as a radio player or mp3 player built in. With this entire choice how are we supposed to decipher which mirror is the appropriate one for our needs? I’ve split the decision making into a few short precise paragraphs which hopefully will help you to make the right decision on bathroom mirrors. Modern functions such as LED lights built into mirrors or radio players are simply fantastic innovative ideas which have been seen through from idea to full product. They are beautiful to look at and all the functions are useful if required. One modern function on some mirrors is the addition of a digital clock this I think is a pure genius idea. This in my opinion is genius mainly because I am always running late because I’m spending to long in the bathroom and there is not clock in there. Having a mirror with a clock in it means you can glance at it at any point and always know what time it is if you can spend an extra 5 minutes in the shower or have to jump out and drip dry while putting your shirt on. Such an innovative function is great if you use it and if anything could save you money by helping you to be on time for work. In short modern gadgets and functions are brilliant and defiantly add a new dimension to a bathroom mirror. Standard mirrors are exactly what they say they are mirrors that are just standard and simple. There are no lights or gadgets attached or built into them they are simply just mirrors that reflect what is positioned in front of them. The great thing about standard mirrors is just that, there is no fancy light’s or radio that could potentially break and they are also considerably cheaper in price. There is also a huge amount of choice with different shapes and sizes meaning you don’t have to sacrifice style. But therein lies the problem with standard mirrors they are simple and don’t offer any other additional functions. So in conclusion to this short but apt blog on whether you should buy a modern gadget mirror or a plain simple standard mirror is …………. The choice is up to you. I know the answer is not what you were expecting or wanting but that is the only answer that I can give. Bathroom mirrors are like any home furnishing it needs to fit in with your style and preference and has to be something that you will use. If you will use the added functions on some of the mirrors and feel they are worthwhile then a modern multifunction mirror would no doubt suit your needs. If you don’t need or like a digital clock or radio built into your mirror then a standard mirror would no doubt suit your needs. It is all down to personal preference really I mean who am I to say what bathroom mirror you should own in your home, after all it’s your home not mine. Hope you have found this useful please by all means comment on what your preference of bathroom mirror is. This blog will be dedicated to bathrooms, home furnishings, DIY and general home improvements. We’ll also be showing how our products can be fitted and make your bathroom extra special. Why not follow us on twitter or chat to us on Facebook, we’d love to hear from you!